(Newser) – A healthy diet isn't just good for your waistline, but also your brain, say scientists in a study in Neurology—the latest to tout the benefits of the Mediterranean diet. About 400 healthy Scottish volunteers kept a food diary at age 70, then underwent MRI scans of their brains at 73 and 76, per the Los Angeles Times. 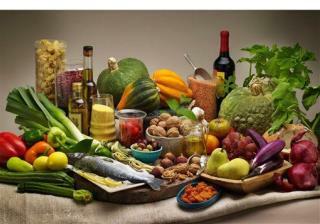 All brains shrink with age, but researchers found those who ate a Mediterranean diet lost less brain mass than others. In fact, their brains appeared to shrink at half the rate of those who ate less healthy food, says study author Michelle Luciano of the University of Edinburgh. What's so great about having a bigger brain? "People who have bigger brains in general can tolerate more brain pathology, more brain disease, than those who have smaller brains," a doctor not involved in the study tells NBC News. Bad news is that you have to pay a lot of $$$$ to go on that Mediterranean diet! I'll just have my NEW JOISEY BLUEBERRIES & TOMATOES & a lot of other local Farm Grown Vegetables here in NEW JOISEY available in the spring & summer months! There ya go ALL! A bit of self selection here....what if the result is from studying folks willing to change at 70? And diet hasn't a thing to do with the results? Maybe it is just the learning something new and keeping up with learning? In other words, exercising the brain.